So I am here to share Week 2 of my Project Life for 2015. I know this is a bit weird as I have already shared Week 3. This is because I was working in chronological order however when I received my SCRAPPERY KIT it worked better with my week 3 photos as I had photographs of ice creams and strawberries. This week I used a selection of cards from The Scrappery, Dear Lizzy and Heidi Swapp Colour Magic. This is the first week this year that I have got all my photos on a two page spread and not had to add an extra insert. I have used a fair bit of mist on this layout even some of the Wake me up before you go gold mist from Lindy's stamp gang and also some Gelatos. I am loving using my gelatos at the moment. On my title card I have used the Amy Tangerine brush script thickers. I love these thickers and they really make the title card stand out. The flower is from the Maggie Holmes Open book collection nd the cluster in the top corner is a collection of older things I had sitting in my stash. I used a Dear Lizzy card to do my week's journalling on and chose to handwrite this rather than use the typewriter. I do like to mix it up and use written and typed journalling. The filler card featuring the balloon is from a Dear Lizzy collection and I scattered a collection of mist, sequins, rhinestones and wood veneer to act like 'confetti'. These are the gorgeous cake smash photos that I was talking about. I just love them. I am lucky to have a sister that is such a good photographer. She did a fantastic job at catching my son's happy and carefree spirit. It got so messy but it was all so worth it. I hope you enjoyed this look at my week 2 spread. 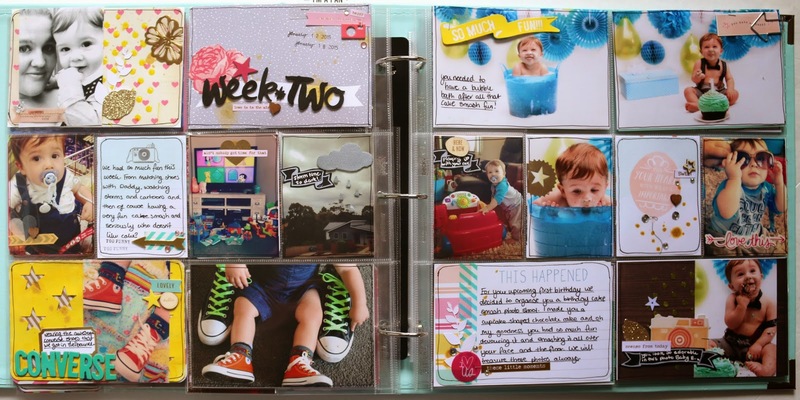 Next up I will be sharing my week 4 spread and also some of the spreads I have been catching up on for 2014 in my son's first year album.